Save the date- Memorial Day weekend- Sunday May 26th it's going down at Henderson Stadium! 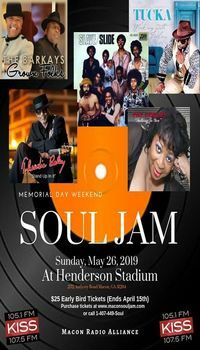 The annual Soul Jam music festival featuring The Barkays, Slave, Tucker, Pat Cooley, Theodis Ealy, The Soul Jam Band, Just Friends, John Dunn & The Jazz Men and Wes Love will be bringing the SOUL to Macon. Don't miss your opportunity to get your early bird tickets and take advantage of this awesome deal! Voucher Redeemable at iHeartMedia Macon office - 7080 Industrial Hwy, Macon, GA 31216. Voucher redeemable Mon-Thur between 9am-4:30pm.